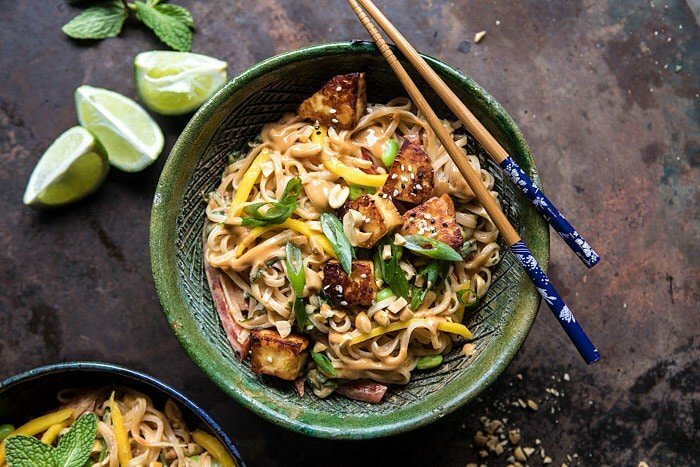 better than takeout 20 minute peanut noodles with sesame halloumi from Half Baked Harvest on Vimeo. Oh how I could kill for a bowl of these noodles right now. I may be in Korea, but with the businesses of everything we have been doing, we have not had any time to explore and find good authentic Korean food. So far we’ve eaten a lot of kimchi, beef bulgogi, and shrimp fried rice…for breakfast. It’s definitely been very interesting. As I write this, it’s the morning before my brother, Red competes in finals, so approximately four fifty one am on Sunday morning here in PyeongChang. I am all messed up with what day it is and when I should be sleeping, but I am so thankful to be here with my family and watching my brother do something that is beyond incredible. I’m amazed by him, and no matter the results, I will forever be proud of Red for making it to the Olympics…and now the finals. The kid is only seventeen and has accomplished one of the biggest goals imaginable. I plan on a quick update for you all tomorrow, but I’ll be doing a full recap of the trip when I return home later this week. Until then, I’m going to try to soak in all that we are experiencing here. For now though, let’s talk noodles! It’s no secret around here that I love peanut butter and noodles. 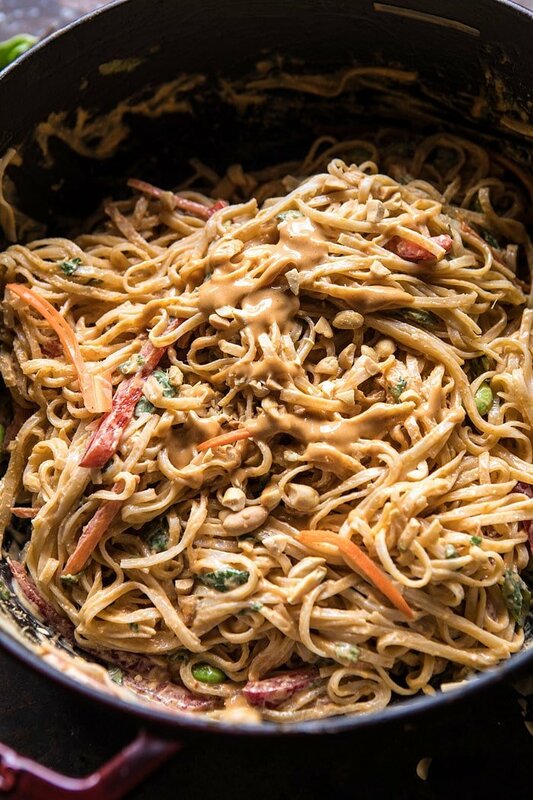 Most frequently my peanut butter is paired with sweets, and my noodles with cheese, but peanut noodles have always been a favorite of mine and it’s about time I shared a recipe with you guys. This recipe is up there in my top favorites, and for two reasons. Two, it’s so good…addictingly good. This noodle recipe is all about the sauce. 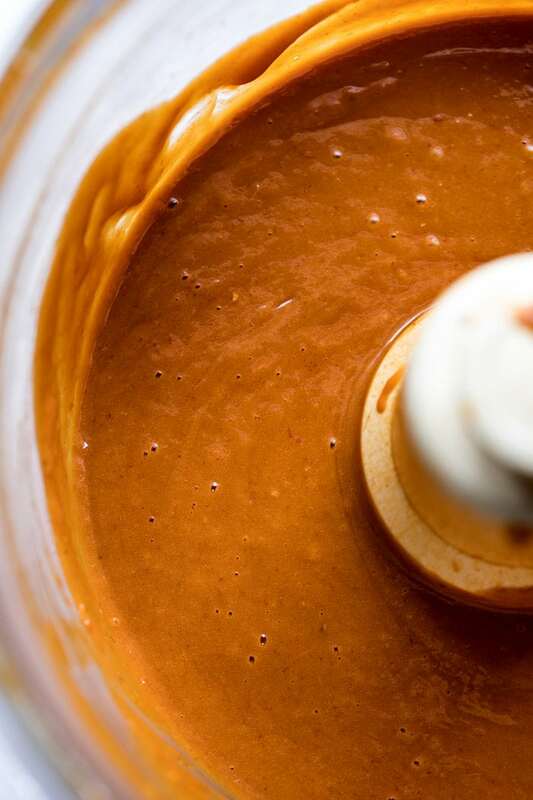 It’s heavy on the peanut butter, and flavored with Thai curry paste, ginger, honey, and toasted sesame oil. Everything is mixed in the blender and then tossed with hot noodles and topped with fresh lime, basil, and cilantro. 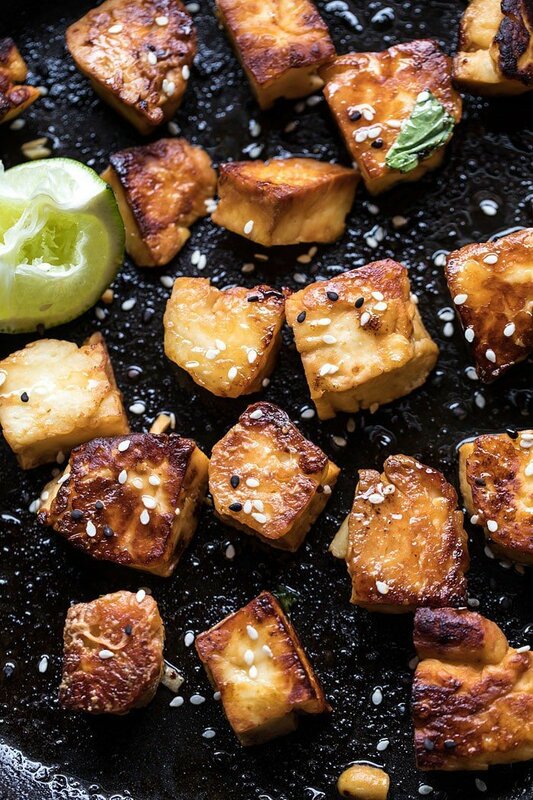 To add an extra layer of texture and flavor I pan-fried some Halloumi cheese in soy and sesame oil. It’s kind of like crispy tofu…but better. I mean, it’s salty pan-fried Halloumi cheese atop peanut noodles. I don’t know about you guys, but that sounds pretty awesome to me. The major bonus to this recipe…just how quickly this dish comes together! Twenty minutes and DONE. Yup, I sure am good with that. This recipe is all about the sauce! But to create an extra layer of texture and flavor I added pan-fried Halloumi cheese. 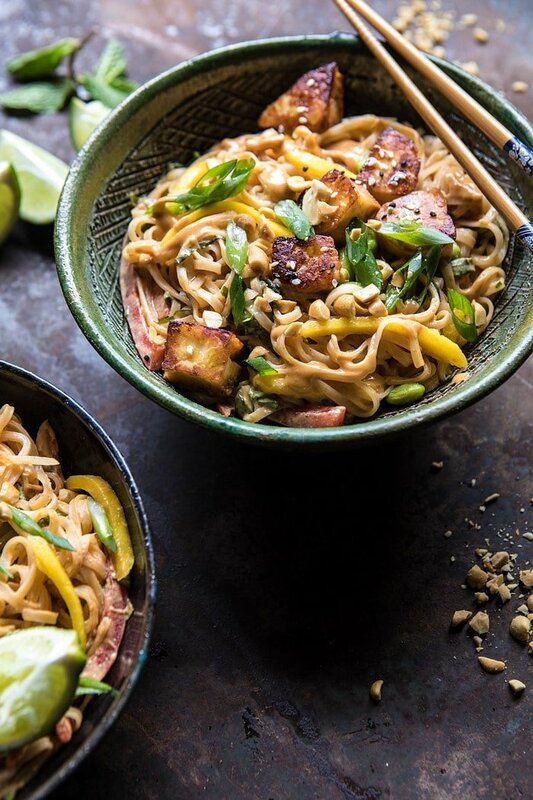 Salty pan-fried Halloumi cheese atop peanut noodles...all on the table in 20 mins - wow! 1. Bring a large pot of salted water to a boil. Cook the noodles according to package directions. Drain. 2. Meanwhile, combine the peanut butter, soy sauce, sesame oil, honey, chili paste, curry paste, ginger, garlic, and 1/2 cup water. Pulse until combined and smooth. Pour the sauce over the hot noodles. Add the lime juice, basil, cilantro, carrots, bell peppers, mangos, and edamame. Toss to combine. 3. Heat the sesame oil in a large skillet over medium heat. When the oil shimmers, add the Halloumi and cook until golden, about 5 minutes. 4. 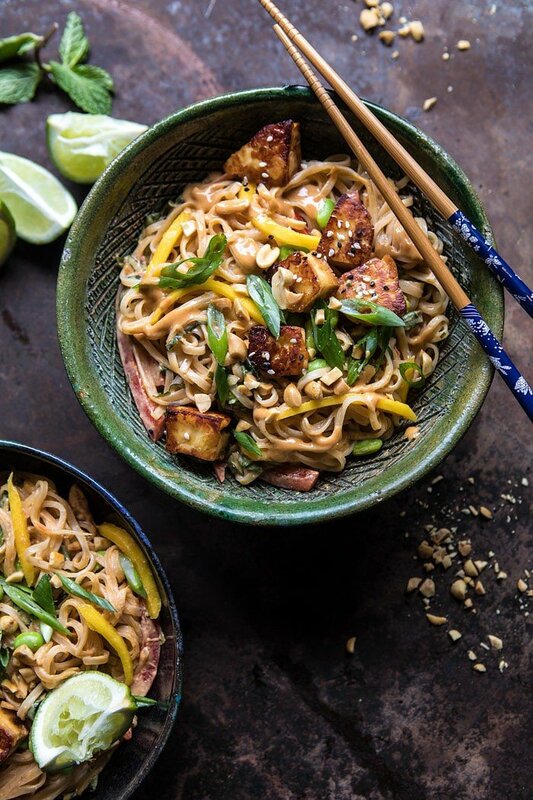 Divide the noodles among bowls and top with Halloumi. Enjoy! Trust me…these noodles need to be on your dinner table tonight. 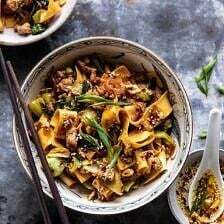 Better Than Takeout Szechuan Noodles with Sesame Chili Oil. this looks sooooooo creamy it must be sinful for sure!!! so good! What sort of curry paste do you use? Green or red curry? Looks delicious! Congratulations to you, your whole family and especially Red. What a family of super achievers! I watch your brother Red win the Gold this weekend, your family must be so proud of him, and so excited to see where his snowboarding career takes him, All the pictures you posted of your family are beautiful. Thank you so much Dawn! I am so glad you watched! Great recipe; but MAJOR CONGRATULATIONS TO YOUR BROTHER!!!!!!!! P.S. – Tieghan, I hope you won’t judge me for watching this show; but at the very end of The Story with Martha MacCallum on Monday night, Red and his amazing win was the feature! As was his SnapChat about his family/friends, haha 🙂 Sending more congrats again from Cleveland. Thank you Liz!! That is so amazing, maybe I can look it up to see it! I am so glad you recieved it! I hope you love the recipes in it Ann! Thank you so much! Congratulations to your brother! We missed his race but saw him during the women’s races. What an incredible experience for all of you. This recipe looks amazing! All your recipes I’ve tried have become instant favorites in our house. I’m making your fruit cobbler from your cookbook tonight. I can’t wait! Thank you so much Catherine! I am so glad you enjoy my recipes and are excited for Red! Tieghan, As I read this I already know that Red won the Gold and was the first American to do so. As an American from Aspen, Colorado I cannot tell you how thrilling this is. We have 5 kids from Aspen competing in these Olympics also. I have already been on a Facebook page telling my friends that His older sister is a cookbook author and food blogger extrodinaire. Since I feature some of your recipes on my good blog, many of my friends have your book. Again, congratulations to your younger brother. Quite a special family. That is so amazing! Good luck to them, Mary! Thank you so much for mentioning my blog, I am really glad you enjoy my blog! Congrats to Red on winning Gold! I am also from the Cleveland area and we are oh so proud! Congratulations to your brother Red!! If it couldn’t be a Canadian I’m so glad it was him! I watched his winning run and he did an amazing job, he should be proud of himself. Thank you so much Nicole!! I am so proud of the kid! Sounds wonderful. I think I’ll go with chicken though. Love peanut/sesame noodles. I totally missed it but I saw that your brother won gold. Congratulations!!! You must be so proud and excited. So exciting having followed you for so many years and having heard stories here and there about your whole family including Red. Then to watch him win a gold medal this weekend, the first one for the US. It was amazing. You all must be so proud, and he is clearly an amazing athlete and young man. We live in Colorado and everyone here is abuzz about him. You hear talk of him and his major accomplishment everywhere. It’s really inspiring to watch our young children look up to him. Hope you guys have a great rest of the time together in Korea as a family. Thank you so much Emmy! I had a great time with my family and loved celebrating his victory! so happy!! Your whole family looked deliriously happy too!! Back here in the States, my grandchildren in their school have been closely following Red for many months!! They were cheering madly too!! I used red Thai curry paste and the dish didn’t really have that ‘curry’ flavor with all the other strong flavors. I don’t think it would be bland if you left it out, though. Thank you so much! Means a lot and so exciting hearing your grandkids follow too! Congratulations to your brother for his awesome performance at the Olympics. You all must be so proud of him! Thank you Rosemary! We definitely are!! 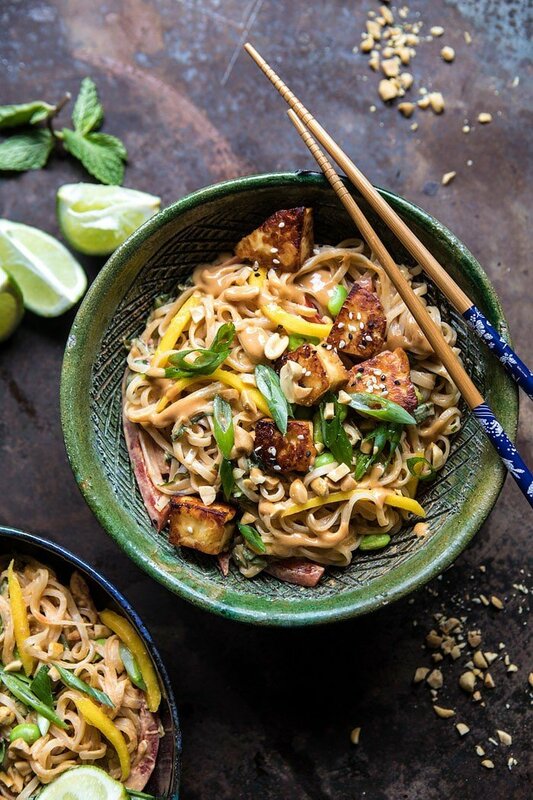 Omg, I’m right there with you about pb + noodles being a match made in heave! Also, it’s absolutely incredible that your brother won gold. Major congrats for your family! Haha, you guys clearly have some serious talent going on. Thanks for keeping up with sharing even while traveling and I can’t wait to hear about the whole trip! Thank you so much Tori! I am so proud of him! Such exciting news! I am thrilled for your brother Red & happy for your whole family! Breath in these moments, capture them in your mind, heart and soul. Then take pictures… like you never have before! I haven’t tried this recipe yet but love everything I have tried on your website. I have turned so many of my friends on to your recipes. Yours is my go-to site when I want something different, and I so often do. On another topic, I had no idea your brother was Red. We watched him make history the other day at the Olympics and watched some of his interviews as well. How cool! Congratulations to your family! Thank you so much LuAnn! I hope you love this recipe! Just watched your brother win a GOLD!!!!! Congrat’s to you all that are there to have seen it and we here in the USA are so proud, OMG. Thank you Sharron!! I am so proud of him and still cannot believe it! This looks amazing, Tieghan! Exactly what I need right now. Also, congratulations to your brother on the gold medal! What a great achievement! Well done 🙂 Enjoy your time in Korea! These look delicious! So exciting how Red got gold. I was cheering him on even though I’m Canadian haha. Can’t wait to try this recipe out! Congratulations to your brother Red on winning gold. Your family must be so proud!!! Thank you Rose! We are all so happy for him! CONGRATS TO RED AND YOUR WHOLE FAMILY! I can’t imagine how thrilled you all are. Wow, I think it was a really bad idea to visit your site all hungry, this looks sooooo good! And congrats to Red, what an honor for a 17 year-old! could I do this with tofu instead of cheese? I didn’t realize you were Tieghan when I was reading about Red online while watching him get gold! I just thought it was fun that someone else probably pronounces her name similar to mine. Congrats to him and your family! It must be such a great time. Also instant pot Korean food, yesss. Thank you so much Tegan! I am so happy for Red, its insane! Also, hope you love this! Congrats to Red on his Olympic victory. Our family cheered for him as much as for our Canadians snowboarders!!! Fab dish!!!! And I can’t believe that is your brother!! I’ve been following you for a couple years and who knew! Lol. Wicked congrats on his amazing win!! 🏅 USA 🇺🇸 Thanks again for another amazing recipe!! Thank you so much Staci! Congratulations to Red and your entire family! What a talented family! And thank you for thinking of us and continuing to send us yummy recipes while you are away – this one looks like it will be a hit with my people! Thank you so much Jami! Cannot tell you how proud of him I am! Congratulations to your brother Red. So happy for you and your family, what an honor to win the first gold! I’m VERY much looking forward to trying this, as it sounds fabulous! One question — which type of Thai curry paste? There are several different kinds, all completely different: red, green, Massaman, etc. Any info on what kind you used would be terrific, Tieghan, and thanks! I used red and it turned out well. Wow, made this tonight…delish! What’s really amazing is your brother Red! My kids & I have been watching him like we know him lol!!! Congratulations to him on winning the First GOLD medal he was SPECTACULAR! The commentators just used his name as an adjective describing one of the girls on the half pipe as I’m typing this! Hope you & your family had fun!!! Thank you so so much Eileen!! I am SO proud and happy for him! That is so funny they used his name as an adjective too, lol! This recipe looks delicious Tieghan. Congratulations to your brother Red for winning the gold medal! That was so amazing – I was watching by myself and yelling! I keep telling people I feel like I know Red because I’ve been following his sister’s blog for years. Your whole family must be so proud of his accomplishments! Have a wonderful time in Korea for the rest of your trip. Thank you Pat! I am so glad you were cheering him on! I love these noodles! I saw a clip of red compete in finals. Did he win the gold? That’s so exciting! I saw you and your family and got goose bumps for him. I hope you’re having an incredible time! What do you have planned for your last week? Thank you so much Kristin! He did win the gold, so happy for him!! Your bro won Gold! Congrats, that is so awesome you were there to see it! I am so glad I was! Thank you Morgan! Looks great–but a couple of questions: how much lime juice and are the edamame cooked? Thanks. Made this tonight; it was OK. I will add more vegetables next time I make it, and maybe a little fish sauce. Note that the ingredient list is missing lime juice (mentioned in step 2) and it doesn’t say anywhere in the instructions to add the edamame. Also I forgot to mention: the mango is amazing in this dish! If anyone is thinking of leaving it out, don’t!! So sorry this did not turn out great for you Amanda! I hope you enjoy some other recipes on my blog! The directions say to add lime juice. How much? Congrats on your brother’s success!!!! It’s 1 lime, juiced and thank you!!! 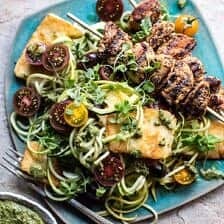 I’ve stumbles across your blog many times over the past couple of years and would pin a recipe here and there but I nw follow you, as your recipes sound rea;y yummy! Although not quite Vegan (I can’t give up cheese) I’m drawn to this blog. So great job!! More important;y, I just read that Red is your brother!!!!! (Insert happy face emoji) HE.IS.AWESOME.!!!!! Congrats yo him! My hubby and I are loving watching the Olympics and we are surprised at how beautiful Pyoeng Cheng is! Hope you’re loving every minute of it! 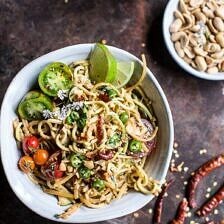 Now i have to go and attempt the Peanut Noodles recipe! USA!!USA!!USA!!! Hi Dawn! Yes we are all so proud of him and his accomplishments! Totally loving every minute of it.. haha! I hope you love the peanut noodles, let me know! Thank you! Not sure if i can find Halloumi anywhere here. Congrats to red and your whole family. Hi there, great recipe & great win for Red! Hello! Making this for dinner tonight, it says to add the lime juice in step 2 but it isn’t in the ingredients, how much should be added? thanks! I’m confused- I don’t see line juice listed on the ingredient list… yet the recipe instructions refer to lime juice.. This dish looks AMAZING! Will definitely be trying it out. 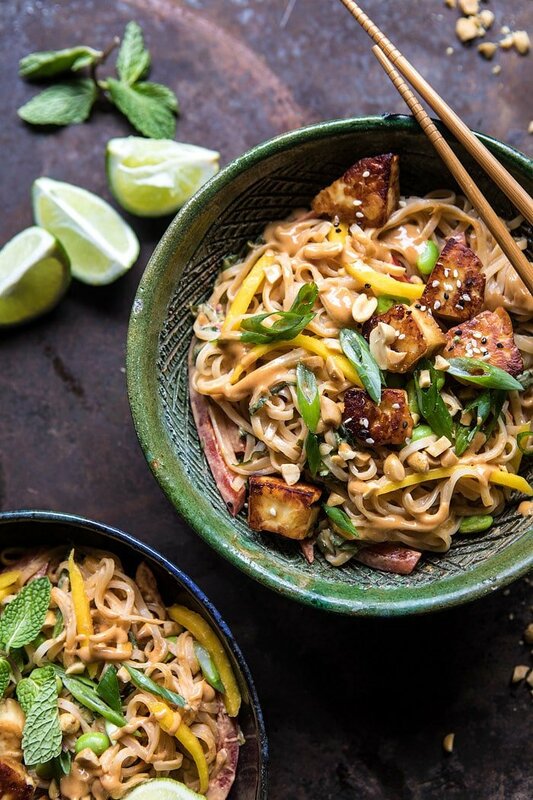 I’ve been loving noodles since being pregnant and this looks like it will totally hit the spot!! This was way too salty! 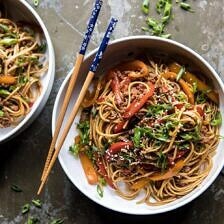 Making this tonight, and will also add some of my asian pan fried tofu! It’s the meals from you that get me through work! Sounds delicious! Let me know how it turns out for you Michelle! Thank you! Loved it but the halloumi turned out to be extra salty with the Tamari sauce. Also the sauce turned too much and drowning the 8oz rice noodles. It looked amazing upon serving but forgot to take any photos. I will certainly try this again though with less sauce and reduced salt soya sauce cause the taste of the sauce was really fascinating! I am so glad you enjoyed this and hope it turns out better for you next time you make it! Thank you! Awh that is so great! Thank you Allie! Can the halloumi taste okay reheated in a microwave? I was thinking about making it for a meal prep plan.. This dish is absolutely amazing! I omitted the mango, as I’m not a fan, but made the rest as described and it was delicious! It definitely took me longer than 20 minutes, but was well worth it! Thanks for another great recipe! I’m going to use your cookbook next month when I host my Cookbook Club and know it’s going to be a hit! I made this for dinner tonight, and, uh, wow, it is a dream come true. I thought it was a perfect balance between salty, sweet, and a little bit of heat. I will be making this for lunch again tomorrow. Thank you so much Claudia! I am so glad you loved this recipe and hope you enjoy others as well! I just made this for lunch and it is ridiculously amazing. I have never tried halloumi cheese before and it was a great combo with this dish. I am really glad you liked this Alison! Thank you so much! Hi Nicole. Thank you for sharing your adjustments, I hope this turned out amazing for you! Made this tonight, and it turned out super good. Will be serving this again. That is amazing to hear! Thank you! What are your favorite brand of noodles to use? Love all your recipes I’ve made so far! Thank you! I just made this tonight for dinner. Amazing!! I actually subbed the halloumi for tofu and it was great – will defo make it with halloumi too to see which I like best. I just wanted to say thanks for all your recipes. I have been so uninspired for about 3 years leaving my partner to do all the cooking. So from him and me thank you so much for being my food muse and getting me back in the kitchen! Keep up the good work! Awh I am so glad my recipes have inspired you to start cooking again! I hope you continue to love them, Kristy! Hey Tieghan! My mom and I made this last night and it was delicious! This my second recipe of yours this week (the first was the no guilt broccoli fettuccine from your book!) and it did not disappoint! While we didn’t have the cheese on hand, the flavors were intense and like you said, addicting! Definitely making again soon! I am so glad you enjoyed this and the fettuccine! Thank you so much Susan! Curious what thai curry paste you used in this? I have red and green at home but not sure which would be the best with the peanut butter, leaning towards green. Or is there another that I am totally missing out on. So excited to try this recipe out this week. I made this, but only used 2 tbsp of tamari in the sauce as I thought 1/2 cup was too much. I also left out the mango (but will try it next time). It came out great, thanks! I think it would also work really well with tofu instead of halloumi. Going to be my saturday night comfort food this week!! Minus cilantro of course! I am one of those that tastes nothing but soap when eating that green stuff! I hope you love this Billie! Thank you so much! This recipie definitely doesn’t take 20 minutites. It is quite a lot of chopping and also you have to fry the haloumi. I’m pretty quick in the kitchen and this took me about 50 minutes total cook time – the recipie looks great, the red peppers and the carrots are a nice splash of color. Taste wise it was ok. From the way the recipie reads you serve the sauce and vegetables cold on top of hot noodles so overall the dish is cold and tastes ok. I’d probably make it again but would stir fry the sauce into the veggies and noodles. I do like all the boldness of the flavour and how it’s a bit experimental. Thank you so much Ayesha! I hope you enjoy some other recipes on my blog as well! Holy Moly, these noodles are amazing. I now want to add fried halloumi to EVERYTHING. I’m single and wanted this recipe to last for several meals, so I made a couple adjustments to make sure it stayed fresh for a few days. I made the full amount of noodles and sauce, and fried the cheese exactly as directed, and saved in a big bowl in the fridge. To prepare, I sauteed a couple handfuls of frozen stir-fried veggies in a pan, then lowered the heat and added a big scoop of noodles and sauce and the cheese and heated until cooked through. It took about 5 minutes after the initial prep day and the flavors got even better over time. It was so fulfilling to come home to a hearty, satisfying, gourmet meal after a long day at work. I look forward to repeating with the mango, edamame, and other fun stuff! Thank you for an accessible, creative and adaptable recipe! Sounds amazing Laney! I am so glad you loved this recipe, thank you! Tonight’s dinner and I am already planning on making it again ASAP. Passed on the cheese as I wasn’t able to find. Omitted honey as my husband isn’t able to process refined sugars. I often add some apricot jam (sweetened only with juice) when a sweet flavor is needed. But am out of it. Lastly I cut chili paste and curry paste by a third as I was afraid it would be too spicy for us. It has a gentle kick but I could tolerate a bit more heat. Does tag my photo mean Twitter? I’ll give it a shot. I am so glad you loved this Teresa! Thank you!! I would make this again, just continue to use the other sauce recipe. Hi! I am so sorry you found the sauce too salty. I am glad you still enjoyed the rest of the dish. Thanks! Made this tonight and loved it! Even our two resident meat eating men flipped for it! Thanks for the recipe! I am so happy to hear that! Thank you so much Sam!! Just made this yummy recipe today and absolutely love it!!! Been looking at your instagram and blog for a long time but this is the first recipe I’ve tried and cannot wait to try many more! Ill definitely have to get your cookbook soon! Hi Sage! I am so glad you enjoyed this recipe! Thank you so much! Also, totally hope you love the book if you get it! Made this with shrimp this weekend with some friends. Amazing and so flavorful! Red or green Thai curry paste, or does it matter? I’m sitting on the couch typing this because it’s sooooo yummy I had to let y’all know!! I love the simple sauce and it’s well balanced. I made it with tofu instead of the cheese and it’s great!! Thanks!! Perfect! I am so happy to hear that Jessica! Thank you! Is the sesame oil you use to cook Halloumi different than oil used for peanut sauce? This is the best spicy peanut sauce I have ever had, if you haven’t tried it yet you are surely missing out. That is so amazing to hear! Thank you so much Tar! This SAUCE is EVERYTHING. Just finished eating this with soba noodles & pan fried tofu (in place of the cheese), so good. Didn’t have basil, edamame, or curry paste but it still turned out amazing. The sauce was easy to make in a food processor and I typically have all these ingredients already on hand. I will definitely try this out with other veggie, protein, and noodle combos. I am so glad you loved this Darrah! Thank you so much! I just did the sauce. Amazing best sauce for stir fry’s. I am so glad you loved the sauce, Kal! Thank you! This took me nearly 45 to prep. I’m an organized cook and have expert knife skills. Double the time easily. Takes 5 minutes just to pull all the ingredients. Hi Gkenda! I am sorry this took so long to prepare! I hope it turned out amazing! Just reading thru your Top 25..and I see if missed a few when originally posted. 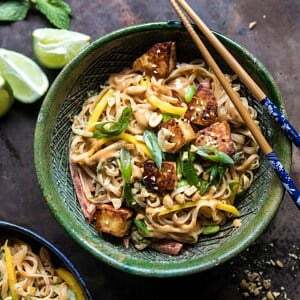 The quick noodle recipe sounds intriguing..But i must ask what can i sub for Halloumi cheese ? I never have heard of this cheese.As you know it is hours and many miles to the store, for me. thanks for the Great Flashback collection this AM. Actually said “Oh my God,” after the first bite. Quickly added it to my bookmarks so I can make it again. I am so glad you loved this Amanda! Thank you! Hoping to make this tonight! Looks delish. Question- I don’t have yellow curry paste, but I have green & red paste, and red curry powder. Which would you suggest using?? This was so delicious!! The edamame in the ingredients list isn’t mentioned in the recipe directions— I added it with the carrots, but it might be worth a quick edit to the recipe to add it. Also, I wish I had made this with twice the amount of noodles. 8 oz was barely enough for 3 people for me. But super good!!! Hi Maggie! Thank you so much for your feedback! I love to hear what you guys think! Also, I am so glad you loved this recipe! Thanks again! Hey there! I love the idea of halloumi in ramen, but could it be used with any type of grilling chef? We have a local dairy farm that makes an incredible gretna grillin’ cheese and I’m wondering if I could use that instead? Also, I’m not a fan of peanut sauces, are there any other sauces that could work with this dish? I’m so sorry to ask for changes, I know you worked really hard to make this recipe just right and it sounds and looks amazing! Hi Chris! I will try to work on that! For now, I would suggest an online measurement converter! Thank you! would this work for lunch meal prep and would you change anything to make it work better? how long would this keep in the fridge? Hi! Would it be possible to use other nuts instead of peanuts. I love peanuts but my boyfriend is allergic to peanuts and soy. Maybe I can find a way to adapt it for him so that I can have my peanuts haha. Thanks! Hi Carolina! Yes, that is totally fine! I have hear sunflower butter is super similar in taste to peanuts! I hope you both love this! It was tasty and so yummy ! I add it to my recipes book ! i needed a quick dinner and it just so happened that you posted this on your instagram story today. I ran to the grocery store and had a way more enjoyable evening thanks to this. We made this yesterday for dinner we added chicken to it and it was delicious everyone loved the recipe. Do you think I could substitute tofu for the halloumi? Wholly Halloumi! That was the most amazing Asian dish I have cooked for a long time that tasted gourmet. Did a few swaps: no carrots–used red peppers, sugar snap peas, green onions, and purple cabbage. My six-year-old was all about it too (I tried to temper the heat but out of chili paste so used a squeeze–or two–of Siracha. Next time I’ll have to leave it out). I had major doubts about the Halloumi, but it was so, so, amazing…I’ll be checking your site for what else I can use Halloumi in! I’m stoked to have leftovers for lunches this week! Thanks for an amazing cookbook and blog! THIS WAS SO SO GOOD! I didn’t even make the halloumi (didn’t see it at Trader Joe’s and it was mondo expensive at the grocery store near me) and it was perfection. This is definitely going on repeat, and I hope to try it with the halloumi next time! i wonder how well the leftovers will keep? This made a huge portion, much more than I anticipated! another excellent contribution added to my “will make again list.” With the first one under my belt, I see lots of opportunities for more veggies – one of the reasons I return to your web-site time and again: the opportunities for slight modifications without a negative impact on the final dish. I had never heard of Halloumi cheese before. I went to our local gourmet store with fingers crossed and found it. What a treat and great addition to this dish. THANK YOU for your diligence and generosity in sharing these recipes. Hi! I made this last night and it was delicious! For some reason it made too much sauce when I did it and it was looser and not as creamy as yours looks. I’m wondering if the brand of peanut butter matters. I used an organic Trader Joe’s creamy peanut butter – the kind where the oil separates. I’d like to make it again – can you reco a brand of peanut butter that you use? I loved the recipe, but where was the edamame supposed to go? It was listed in the ingredients, but not the recipe. It’s great thanks for the recipe. Just got hungry by looking at halloumi cheese. eally kills for a bowl of these noodles right now.